I am going to a bridal shower today for my Sister-in-Law so I wanted to make an extra special card. I am so over the moon with all the doily stuff lately! So for this card I knew what I wanted the theme to be! I used both PTI's Delightful Doilies and My Mind's Eye Stella & Rose Gertie "Girly" Stamps (I saved you the hassle of googling the stamps and linked them for you...not that I'm trying to enable you or anything, heehee!! Did I mention they are CHEAP...like less than $6 cheap??). The color scheme for the shower is Scarlet Jewel, Hawaiian Shores & a touch of yellow (I know since I made & designed the shower invites too...I'll share those at a later date!!). The stamps on the dies are from PTI's set and the stamps on the card base and the envelope are from My Mind's Eye. Pretty stamps huh!? Can you see all that glitter? You can't miss it at my house because when I was gently pouring it the lid came off and I had the hugest pile of glitter I've ever seen! I have it ALL over me now...but at least I sparkle! 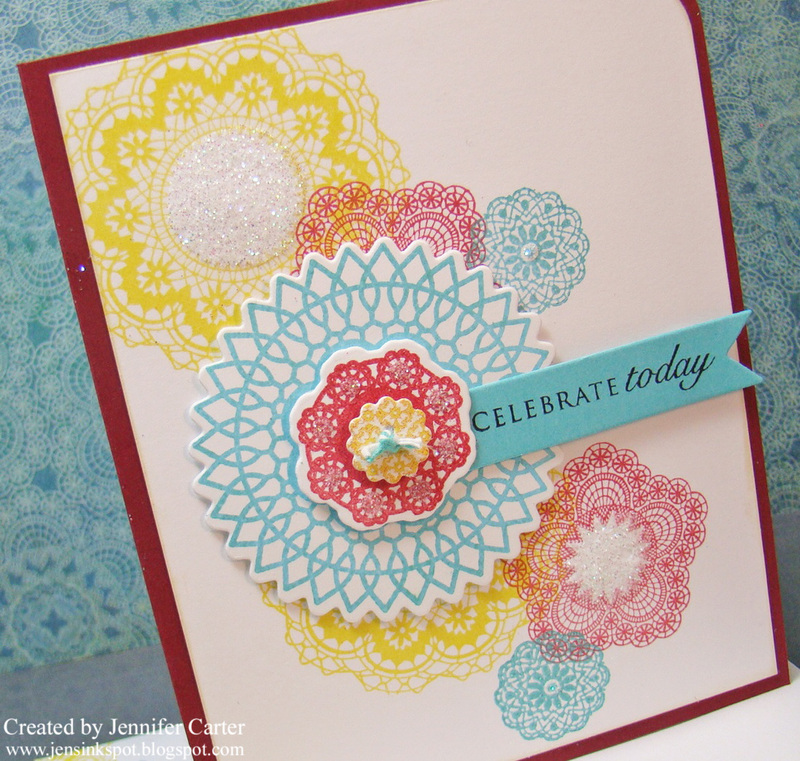 :) The centers of the doilies on the card base all have glitter and the red doily die also has glitter on each circle. It is so pretty in real life! I hope that Anne likes it! I also took a clothespin (which I forgot to photograph), covered it with paper from My Mind's Eye that matches these doilies (YES, there is matching paper too...be still my heart!!) and poured glitter all over it. I'm going to attach it to the gift bag and hang the envelope from it if it isn't too heavy. I hope you all have a great weekend!! Take care and thanks for stopping by! Welcome to the February Papertrey Ink Blog Hop!! "This month we decided to dedicate the Blog Hop to scallops! We want to see your best use of scallops, of any sort, on a project! This can include scalloped borders, offset-scallops, stamped scallops, scalloped mats, scalloped frames, layered scallops, scalloped tags or anything else you can dream up! We are looking forward to seeing all of your amazing creations!" I wanted to do something different with scallops! I love scallops, they are so fun, but wanted to try to use my newer stuff and to use them in an unusual way. I thought that the "Fancy Buttons" stamp from the Button Boutique stamp set fit the bill perfectly so I used it on two cards! I took the stamp shown below and created a border on my card making large scallops. Then, I turned the card upside down and stamped the "Fancy Buttons" stamp again 3 times to make the scallop the other way too. It's hard to see but if you look closely, you can see that this stamp created the purple border in the photo. Here's a little more of a closeup of the images on the card. Can you spot all the scallops? I used a piece of score tape for the Make It Monday PTI Challenge #3 and then sprinkled purple glitter on it to cover up the seam where the two rows of stamps meet (that was the PERFECT way to hide it!!). Very simple but a new, fun way to make a scalloped border! I couldn't resist throwing in a scalloped doily or two, some scalloped buttons and the Tag It's frame stamp! For the next card I kept things VERY simple and used the same "Fancy Buttons" stamp to stamp a border at the top of my card. I have to say that I LOVE, LOVE the sentiments in this Tag It's set!! The font is so fun and probably one of my favorites!! I also love how the twine adds just the right amount of emphasis to the card front without overdoing it or taking away from the other elements! 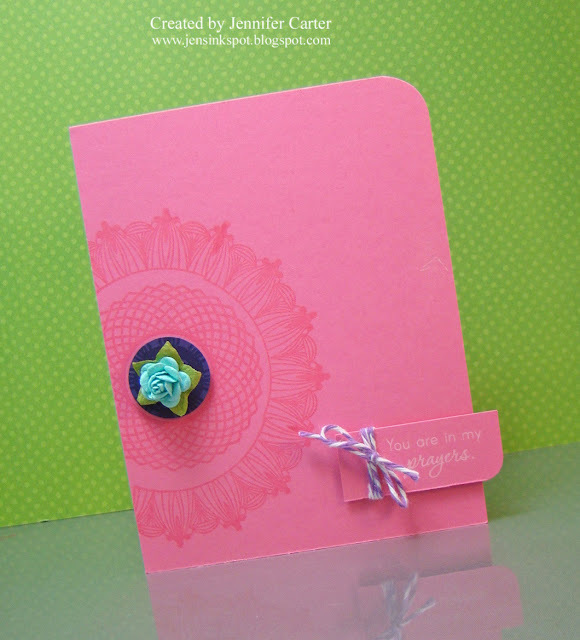 I used the scalloped button dies to create a scalloped button border using the medium sized button for the top of the card. Just changing things up again! 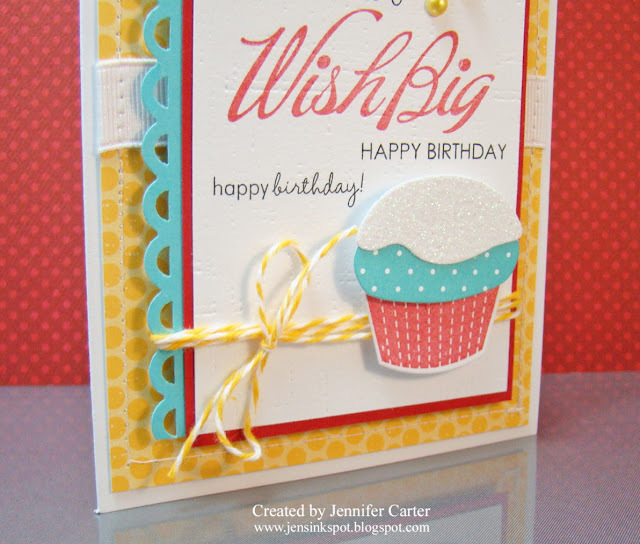 I think it's fun to see a 3D border at the TOP of a card, rather than the bottom or side! Also as a note, this is a 4x4 card and I cut the Rustic White card base so that it was slightly shorter than 4" so that when I added the buttons at the top it would still fit in an envelope made for a 4x4 sized card. Thanks so much for stopping by my blog today!! If you would like to see the other participants of the PTI February Blog Hop, you can visit Nichole's blog here! I was itching to make some doily cards today but knew my time would be very limited so I opted for very simple cards. I really like the results though! Here is my finished set of cards. Aren't those bright colors just yummy!! Oh my!! I am so in love with this new Royal Velvet purple cardstock!! This was the first card in the set that I made. I didn't get my doilies perfectly lined up, but for a first second attempt it wasn't totally awful so I went with it! I used 3 doily stamps. The tiniest one is stamped on the Hawaiian Shores cardstock and the the flower is adhered to it. I wanted to hang a little piece over the edge of the card again as I like the element that that adds to a card. 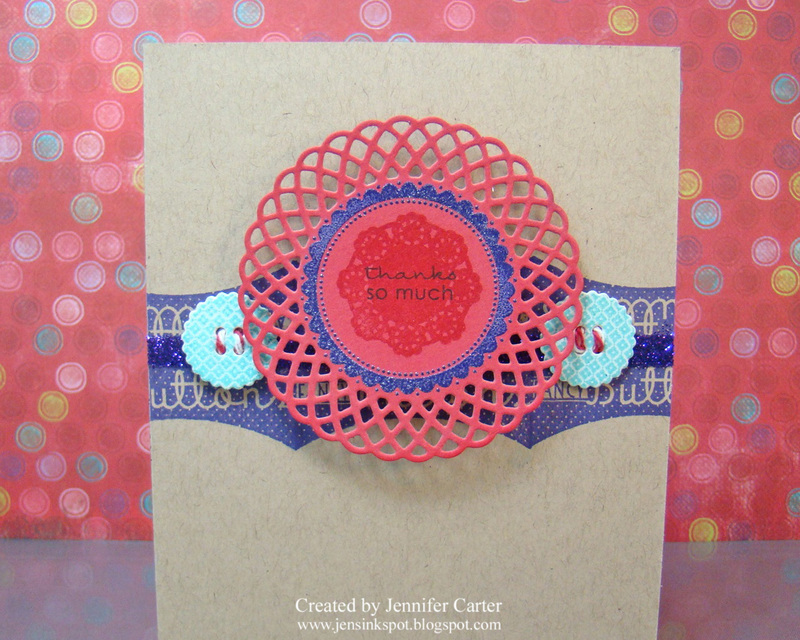 Here is doily card #2. Again, the doily isn't perfect but usable! 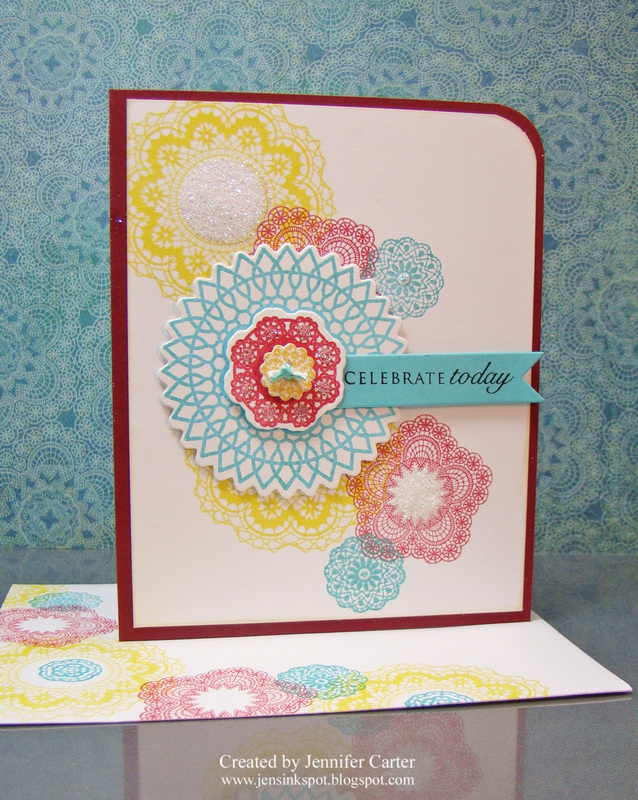 :) I didn't stamp this one quite as far off the side as the one above so more of the doily fills the card. I kept with the same simple design though. Isn't that twine on the side so cute!! I love it! And, finally, here is doily card #3. My middle doily is way off center but hopefully I'll get the hang of it soon. I used Champagne VersaMark to stamp the doilies on all of these cards and I love how it has a soft subtle glitter to it!! To match that I sprayed some clear glimmer mist on my twine to add a little shine and let it dry. It is just a very subtle glitter look and next time I'll probably add another coat or two to make it more noticeable. Well, time to get supper ready! Have a great day!! Thanks for stopping by! Hey everyone!! Sorry it's been kind of quite here this past week. I have been super busy working on an event with our high school youth called "Carnival of Comedy" (I am in charge of the entertainment portion which involves working with the kids on the skits they'll be performing that night). It seems like hours each day have been devoted to planning and replanning and I've made so many lists I can hardly keep them straight! But it is fun and I am excited to be a part of it! I wanted so badly to take a break and make a card today and just couldn't find time or mojo or energy. But then when I thought I was just organizing one last thing, something struck me and I ended up putting together a card. I have to say that this looks so much better in real life than what it does in the photos though. Oh. My. Word. That doily die!? Let me tell you. Fabulous! FABULOUS! I can't wait to make my own doilies in any color or pattern that strikes my fancy! This is one BEAUTIFUL die. So. Much. Detail. And, once I got my die cutout lined up right on the "punch out tool" that you can purchase along with this die, it worked like a charm! Gone are the days of just white or off-white doilies! 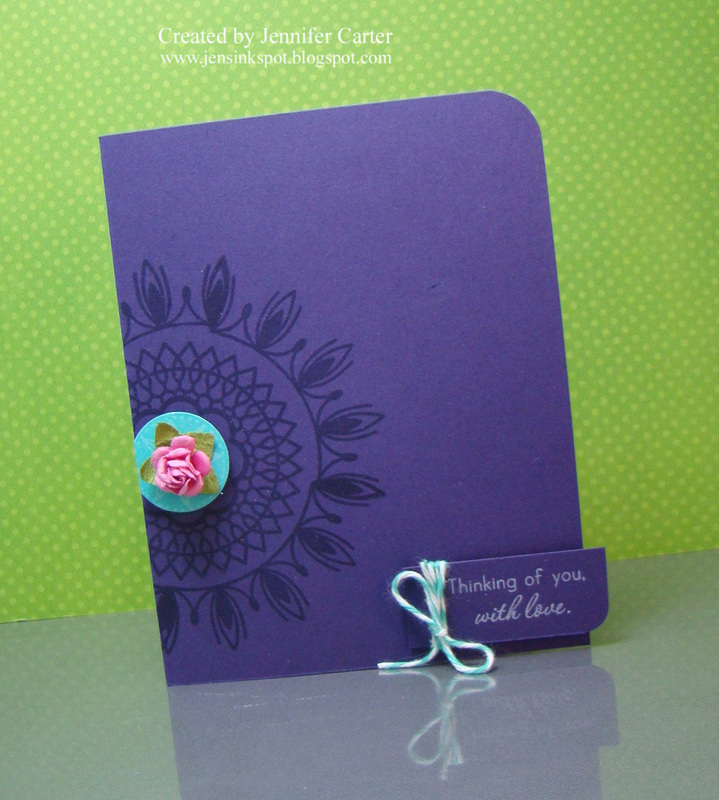 I used purple embossing powder to emboss the button card. It matches perfectly (but is kind of hard to make out in the photos). 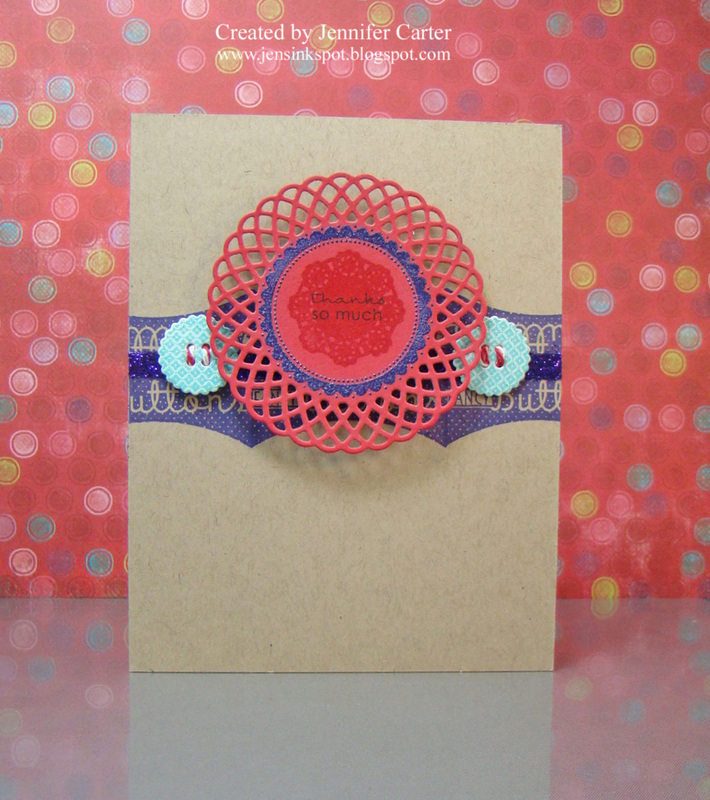 I used 3 colors of twine by The Twinery on this card: Lilac, Caribbean & the brand new Honeydew. I had a terrible time truly capturing that deep purple color of the doily. If you live in Kansas, and as much as it pains me to say this, it is the color of K-State! LOL!! And even this Jayhawk fan has to admit that it is a beautiful purple (but PLEASE don't tell my dad I said that or I could be disowned, lol!!). Thank you for stopping by today!! I hope you have a great day!! Good morning!! 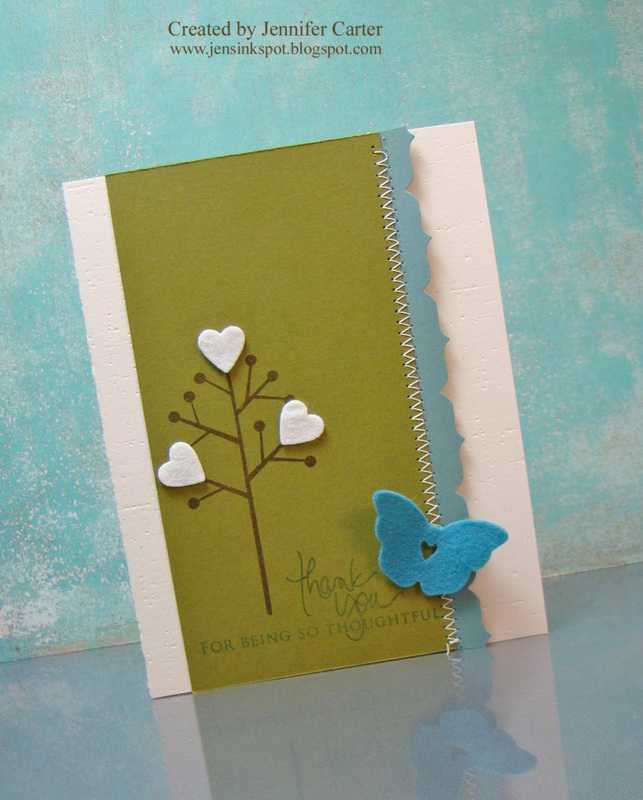 I wanted to share a springy card with you today because it is beautiful outside and I am so ready for Spring! It just seemed fitting! 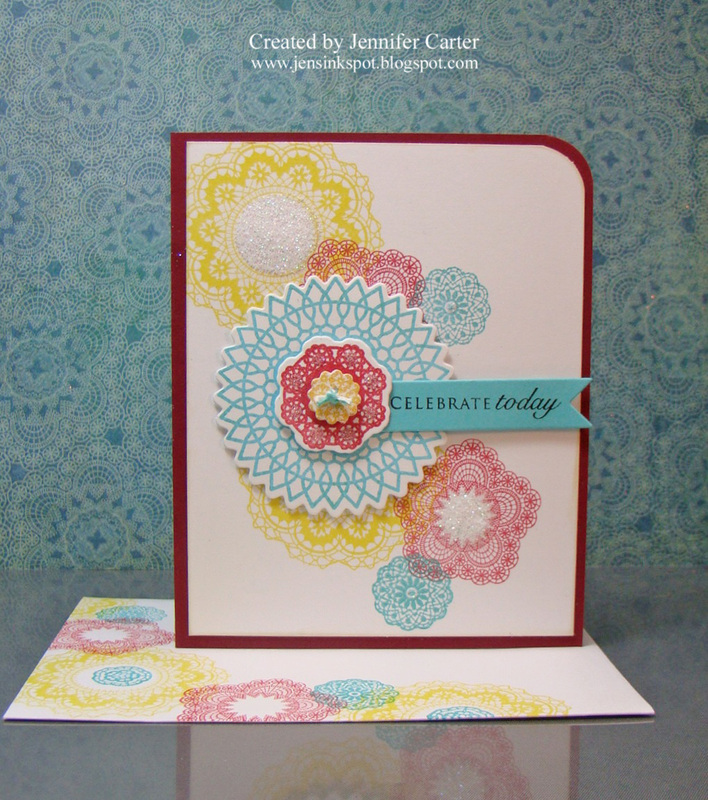 This was a card I made for PTI's color contest last week using Melissa's colors. I stamped the Turning a New Leaf on Spring Moss cardstock and then punched out circles from the Bitty Box Basics Paper (LOVE that paper, so glad I finally bought it!)﻿. Then I used clear dome stickers on top to make them more berry like. I sponged the edge of the cardstock with white ink to soften it up a bit. Thanks for visiting my blog today!! Hope you can enjoy the sunshine too!! I thought it would be fun to try stamping the sentiments on the clouds! What a fun way to celebrate an achievement! On this photo you can see how I staggered the clouds at both the top and bottom and popped the middle cloud out higher above the other two. I also cut two rows of scallops and popped them up as well, each at a different height to make it seem more like the airplane is flying high above the clouds...just like someone who is celebrating something would be! I'm going to enter this in the Make-it-Monday Go-to Sentiment Challenge on PTI that ends today as well! Hi!! I just wanted to quickly share a couple of new rings that I JUST loaded into my Etsy shop! This is such a cute ring!! I love that it is 3 layers of buttons! The bottom button is a reddish-pink color (kind of coral colored) and it is topped with a fun flower/scalloped button! 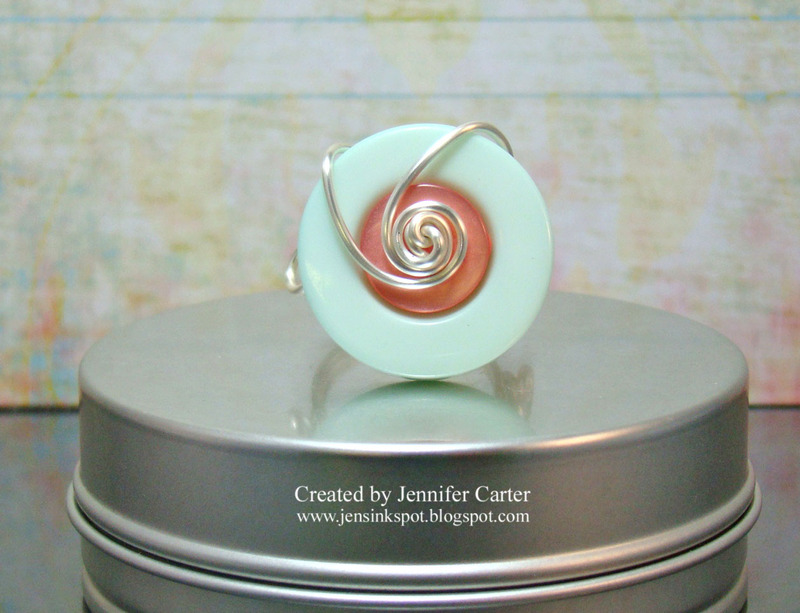 Then, to top the ring off it has a ocean colored button. This is such a cute ring! The largest button measures approximately 3/4" in diameter. 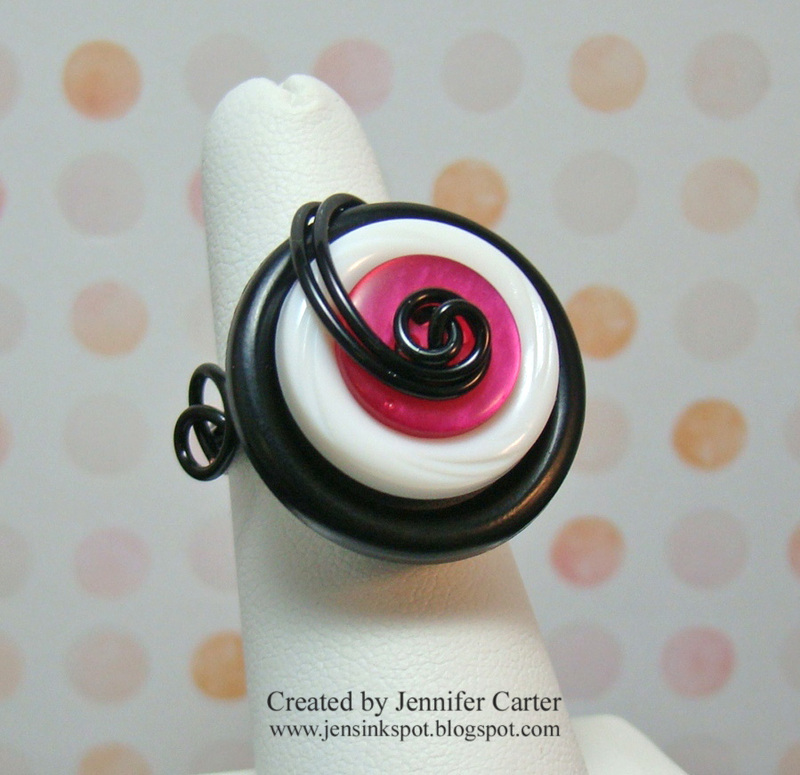 This ring was made for a customer (hope she likes it, it is our school colors!!) and I loved it so much I decided to add another one to my Etsy shop! 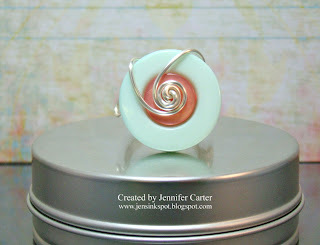 It is another fun but beautiful ring! The bottom black button measures approximately 1" in diameter. 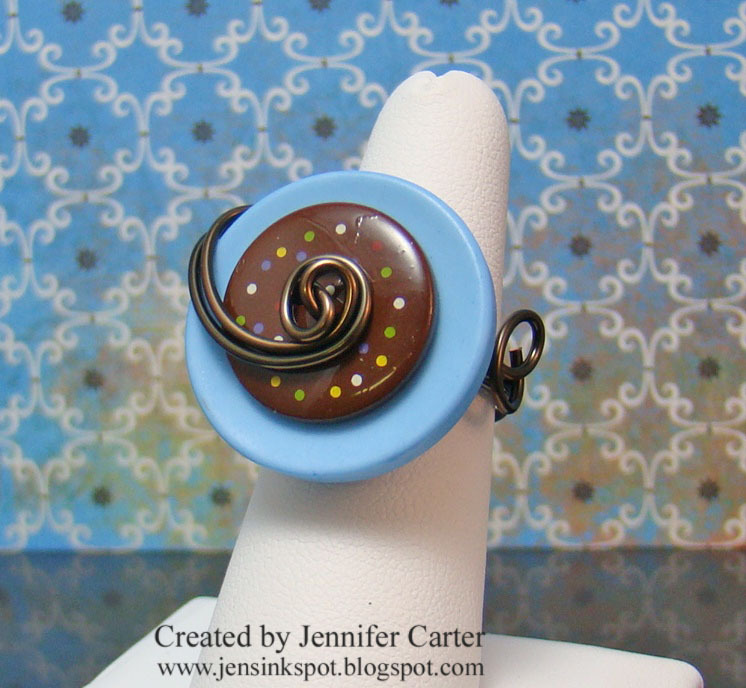 It is topped with a fun PTI orange zest button that truly captures the light. The last layer is a clear button that really enhances the ring and makes is sparkle! It is wrapped with black permanently colored copper wire (but can also be made with silver wire if noted). Don't forget I have a free shipping special going on right now through Monday, February 14th! Just use code VDAYSPECIAL at checkout! 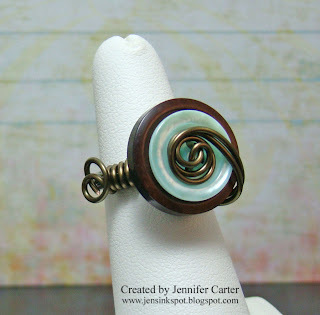 You can check out all of my rings for sale at Jen's Ink Spot Etsy shop here! Today Nichole from PTI challenged us to create a project using a button in a creative way. I decided to pull out my yo yo's and make a card using one of those! If you saw my post with the table I decorated for our church event, than you know that I had purchased some fun red burlap. I had some left over and I cut some with my Heart Prints dies and used one on this card. I love the texture it brings! That black doily use to be white and I made a mess with my black ink pad to color it black. I can't wait for PTI's doily dies so I can just cut a black one myself instead of making such an inky mess! After I adhered the doily to my card, I lightly flipped up the edges of the doily to add a little dimension. Isn't that fabric for the yo-yo a perfect match for using with the Music background! That was such a fun find! You can visit my Etsy shop here and see all the rings I have available!! Don't forget the free shipping offer ends on February 14th! Thanks for visiting today!! Have a great one!! Hi again everyone!! As I mentioned above, this is my 2nd post! I have had an idea in my head for a really long time and today I was able to incorporate part of it into a card! It was so much fun to put it all together! So without further ado, let's get to the card! I love to play with PTI's Up, Up & Away set and I thought it would be so much fun to make the balloons into heart shaped balloons! This idea can be used for events other than Valentine's Day, but I chose to go with a V-day theme for this one. I took my twine and a large holed needle with a sharp tip and stitched the balloons. Then I used pop dots of varying thickness to give them dimension and depth. I almost always use my PTI Sunshine Impression Plate when I use my balloons but this time I wanted to think outside the box and as I was looking through my plates, I found this Giga Guidelines one. I've never used this side of it before and thought it was the perfect time to give it a try. It makes a FUN sun...especially for a lovey Valentine's card! LOL! Such an unexpected element! This photo shows you the dimension and depth of the balloons a little better (the felt doesn't look that wrinkled in real life but the photo captures it all!). Hopefully you can see how the small white heart isn't popped up quite as much as the larger red heart. I wanted to make sure that part of my go-to sentiment panel was highlighted more than some of the other words so I went with black & red ink for the main sentiment and then used my Palette Cognac ink (a nice krafty color) to fill in the other sentiments. 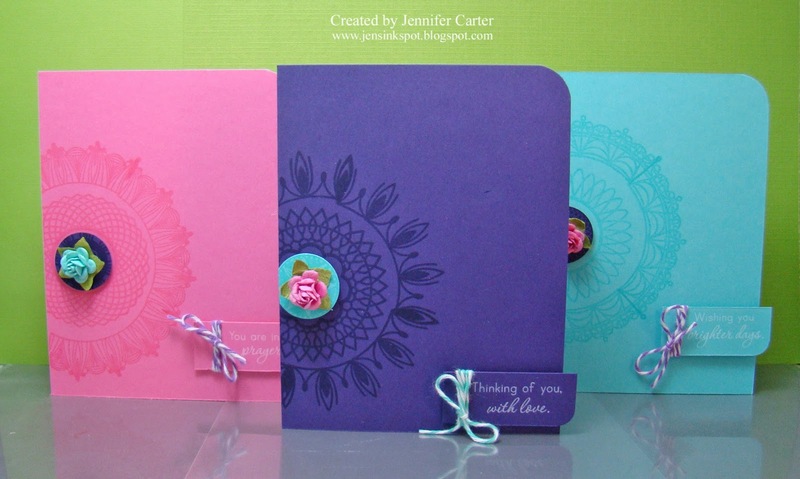 This card is for the PTI Make it Monday Go-to Sentiment Challenge and also utilizes Lisa's Color Challenge colors as well. Thank you so much for stopping by today!! Have a great day! Hi all!! I'm back with another challenge. This one is a color challenge and I picked to work with Erin's color combination of Dark Chocolate, Vintage Cream, Ocean Tides & Ripe Avocado. I kept this card and layout fairly simple. I used the heart prints dies to make the felt hearts and the butterfly from the Love Lives Here collection for the butterfly. After I sewed the border onto my focal piece, I flipped the border strip up just a little to add dimension. 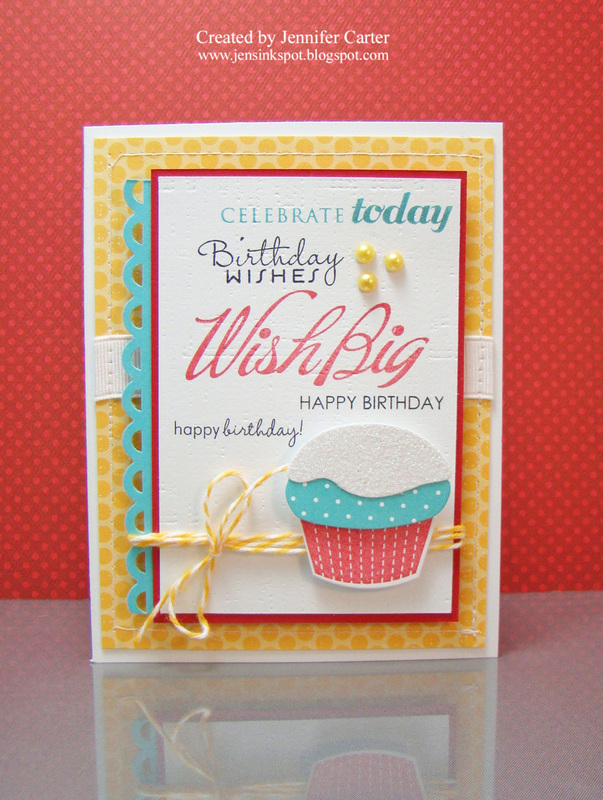 I also used the canvas impression plate to add texture to the vintage cream cardstock. I decided to make a 2nd card for the Make it Monday challenge over at PTI. This time I wanted to go the elegant route which I haven't done for a while. I wanted something classy too so I went with a wedding card. I stamped the guidelines images on soft stone (light gray) cardstock in black, grey and white ink. 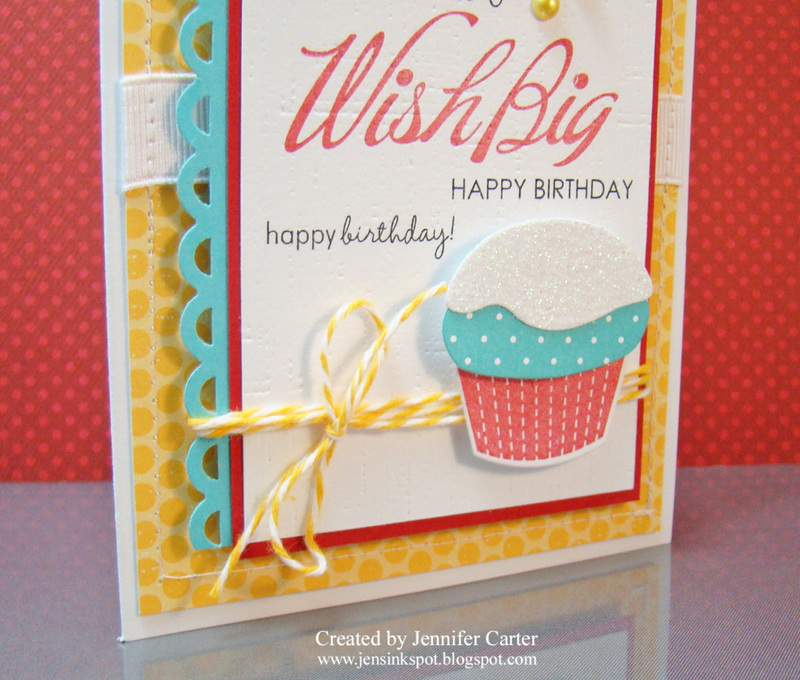 This was the first time that I have used this cardstock and it was a great neutral to use. I'm sure you'll be seeing more of this color on my blog! I used a whole row of silver pearls on the border of this card and also added clear rhinestones to the centers of the black images. I also used one of the banner dies to make the decorative accent. I love using this die to decorate cards with! Papertrey Ink has started a weekly challenge called Make it Monday!! This week's first challenge is to make a go-to sentiment card which is basically a card with a lot of sentiments on it that all say the same thing. What a fun idea! Yep! A cupcake again. I can't seem to get enough of them! They are SO MUCH fun!! 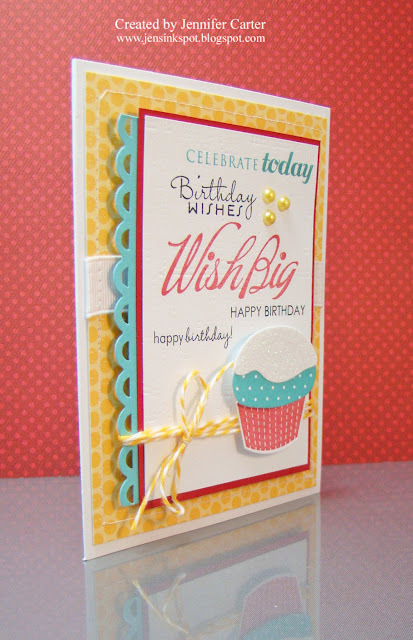 I wanted my color combination to be a super fun one that just "says" birthday! This color combo is Harvest Gold, Hawaiian Shores, Pure Poppy & White. I pulled out some more of my glittery cardstock (yes, I am addicted to it for sure!!) for the top of the frosting. I just love that sparkly look! You can also see that I added some texture to my sentiment panel. I am continually amazed how different a panel like this with an image on it looks after it has had some texture added to it!! It totally changes the look! I also added a little sewing around the edge of the card. This card is also has a lot of dimension! ﻿You can see that better in this photo. Thanks for stopping by today!! I hope you enjoyed this card! Here is my last card (I think, LOL!!) for the PTI Anniversary challenge. This one is my favorite so I saved it for last! This one uses Maile's CUTE pinwheel tag!! I would love if she would create a whole stamp set with pinwheels!! How fun would that be! I colored the pinwheels with my copics and it is hard to tell but I also colored the background of the tag with the lightest blue copic to add a little more color. I also added a red pearl to the centers. This is such a cheerful image!! I can't wait to see what new stamp designs we'll see from Maile in the future!! I LOVE her style immensely!! I'll try to update this list with supplies soon! Post #4 for the PTI Anniversary Challenge. This was a fun card to make!! I used a lot of color, which of course you know I like!! I decided that I couldn't make a card with a rainbow without using the Sunshine Impression Plate! This is going to be such a fun card to give! See that patterned paper? I've have been wanting that for such a long time!! FINALLY got it with a recent order!! YEA!!! I'll try to update this list soon! This is my 3rd entry for PTI's Anniversary Challenge. This one uses Dawn's tag. I printed it 3 times on kraft cardstock and then once on white cardstock. I cut the 3 tag strip out and popped it up. I punched the white tag out, popped up it with pop dots and then added the tag. Super SIMPLE! In this photo you can see where I added dimension a little bit better. I''ll try to update this list soon!